“The hearing ear and the seeing eye, the Lord has made them both” ( Proverbs 20:12 ). The Bible tells us that God’s eternal power and divine nature are clearly seen in the things that He has made. One of the most obvious displays of His creative power is the human eye. Nonetheless, having abandoned his Christianity, Darwin was obliged to appeal to the “absurd” to account for the origin of the eye by random change and natural selection. The eye is essentially a living video camera of extraordinary sensitivity. Like any good manmade camera, the eye has a black interior to prevent light scattering, and an automatically focusing lens and adjustable diaphragm to control the light. And like the most sophisticated modern digital cameras, the eye has a light-sensitive layer (the retina) that can adjust to a wide range of brightness. But unlike any camera made by man, the retina can automatically change its sensitivity to brightness over a range of ten billion to one! The retina’s light-sensitive cells (photoreceptors) can perceive a range of light, from bright sunlit snow to a single photon (the smallest unit of light). The eye also has the amazing ability to assemble and repair itself, unlike manmade cameras. 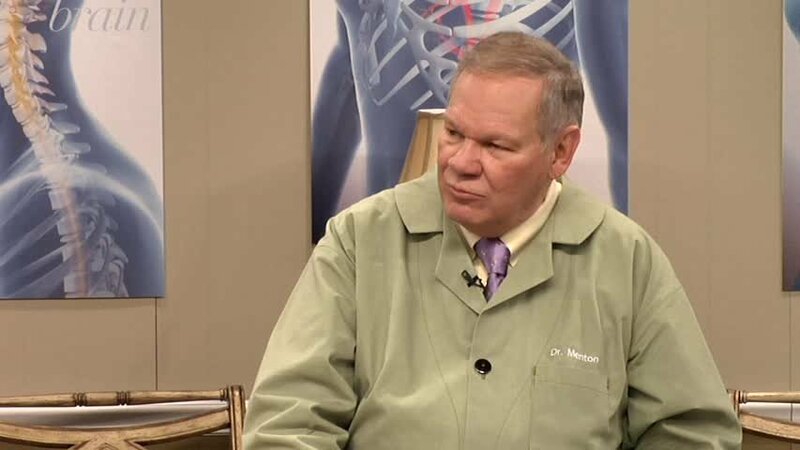 In this episode from his series Body of Evidence, Dr. David Menton teaches about the remarkable design of the human eye. It is said that a camera is no better than its lens. How good is the lens of the human eye? Actually, the human eye has two excellent lenses—the cornea and the lens proper. During our development in the womb, embryonic skin over the developing eye turns into a clear window. To be so crystal clear, this special type of skin lacks the blood vessels, hair, and glands in most other skin, though it contains many nerves (and is highly sensitive to touch). Although we tend to think of the cornea as a protective window rather than a lens, it really functions as a lens. In fact, the cornea is about four times more powerful in bringing light to focus on our retina than the lens itself. The lens proper, like the cornea, is also derived from embryonic skin and is marvelously transparent. 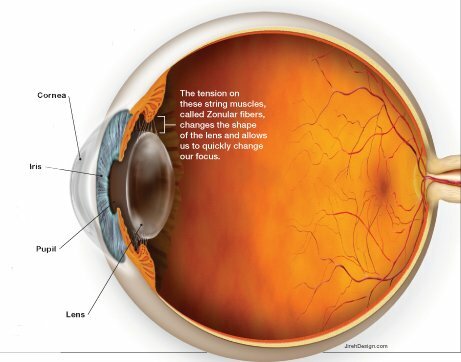 Unlike the fixed cornea, however, the lens can change its focus. This automatic focusing function allows us to quickly focus on any object we look at. Most cameras focus by physically moving their hard lenses, but the lens of the eye is flexible like rubber and can quickly focus by changing its shape. 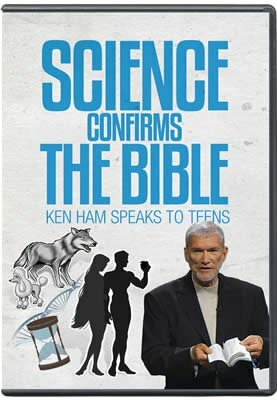 Since man’s fall into sin, much of God’s original creation is now less than perfect, and so the lens loses flexibility with age, reducing both its clarity and its ability to focus. While the cornea and lens develop from embryonic skin, most of the eyeball develops in the embryo as a bud from the brain. Think of it, you can actually examine part of someone’s brain just by looking them in the eye! The eyeball buds off the brain in just the right position for it to look out through the lens and cornea. It would be a shame to have eyes in our head, but no windows in the skin to look out through. 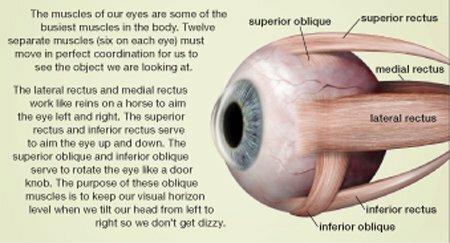 We don’t generally think of our eye as a muscular organ, but this small orb has some of the busiest muscles in the body. There are two sets of muscles inside the eye. One set opens and closes the iris diaphragm, admitting different amounts of light. The second set of muscles is attached by “strings” to the perimeter of the lens and changes its shape during focusing. Just think of it. Everywhere we turn our gaze, twelve separate muscles (six on each eye) move in perfect coordination for us to see the object we’re looking at. If our eyes are even slightly misaligned, we see double. This remarkable coordination is like a marksman so accurate with a pair of pistols that he can make only one bullet hole every time he fires both guns! Our eyelids not only protect our eyes and cover them when we sleep or blink, but also serve as window wipers for the cornea. Deep under the upper eyelid, toward the side of the head, each eye has a special reservoir of eye-washing fluid called the lachrymal glands. These glands secrete a watery tear fluid that has just the right acid level (pH) and osmotic (concentration) properties. The fluid also contains special enzymes that keep the eye clean of things that cause infection, and it has special oils to reduce evaporation. It also gives our cornea a smooth surface for optimum vision. If you look very closely at your eye, you will notice a small opening on the margin of your upper and lower eyelids near the nose. These holes, called puncta, are attached to pumps that remove the tear fluid as it flows across the eye and drain it into the nose. This continuously flushes our eyes of debris and keeps our cornea from drying out (which can cause blindness). 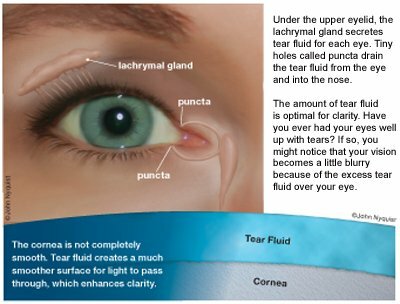 When we produce too much tear fluid (as in weeping), the layer of liquid over the cornea can get too thick, affecting our vision. As the tear pumps remove the tear fluid and drain it into our nose, we get the sniffles. If too much tear fluid accumulates for our pumps to keep up with it, tears overflow and roll down our cheeks. We humans are the only creatures God created that can cry emotional tears. We are also the only object of the redemptive work of Jesus Christ, who came into the world to save us from the wages of sin. What a wonderful comfort that our Heavenly Father has promised to wipe away all our tears of sin, pain, and sadness. “And God will wipe away every tear from their eyes; there shall be no more death, nor sorrow, nor crying . . . for the former things have passed away” ( Revelation 21:4 ). The eye is essentially a living camera of extraordinary sensitivity, yet it is much more superior to any manmade camera. Each part of the eye has unique responsibilities to allow us to see. The eye is similar to a camera, yet can do much more. The eye is self-lubricating, self-repairing, and self-cleaning. Unlike any camera, the eye converts images into electrical signals that are sent immediately to the brain, where it processes those signals and makes necessary adjustments. About four times more powerful than the lens in bringing light into focus, the cornea is the thin covering over the front of the eye. The iris is the colorful part of the eye. It consists of two sets of muscles that work together to open and close the iris diaphragm. The pupil controls the amount of light let into the eye. The two sets of muscles in the iris control the size of the pupil. The lens is flexible like rubber and can quickly focus by changing its shape. 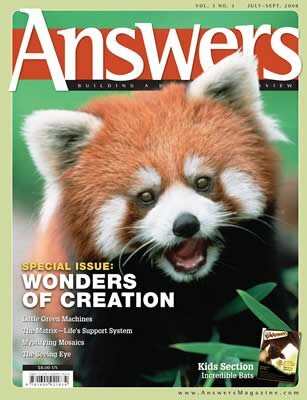 In this issue discover the wonders of God’s creation and see how our Creator is clearly seen all around us. Articles cover bizarre creatures in the fossil record, the intricate “matrix” of bacteria, the eye, and many other marvels. C. R. Darwin, The Origin of Species by Means of Natural Selection, 6th ed. (Senate: London, 1994), pp. 143–144.